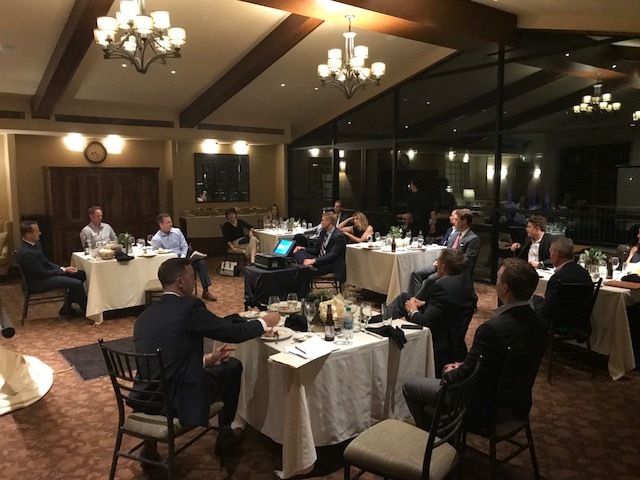 PHOENIX, ARIZONA (August 13, 2018) – It was an evening of celebration this summer as the NAIOP Arizona Developing Leaders Young Professional Group (YPG) Mentor Program hosted graduation for the 2017-2018 class at Arizona Country Club. Mentors and protégés gathered in a private dining room for a reception, presentations, and a dinner. The 15 protégés, grouped into four teams, pitched development proposals on Packard Stadium, the SWC of Rural Road and Rio Salado Parkway in the North Tempe submarket. Teams were matched (three mentees and one mentor) throughout the 9-month program. Teams created a development and business plan for the site. The program culminated with project presentations to equity sources, pitching them to invest in their respective deals. JMJ Development and its Packard North deal took home first-place honors. The winning project called for 300,000 SF of Class A office with future phases for multifamily and retail. Team members were Mollie Zemer, Barclay Group; Josh Tracy, Ryan Companies US; and James McDonald of Cresa. Their mentor was Keith Earnest of VanTrust Real Estate. The other mentors were Molly Carson, Ryan Companies US; Cathy Thuringer, Trammell Crow Company; and Jim Wentworth, Wentworth Property Company. Event judges were Brian Kearney, Catellus Development Corp.; Ben Geelan, Holliday Fenoglio Fowler, L.P. (HFF); and Ben Baumes, Catellus Development Corp.
Cundiff chaired this year’s program. The other protégés were Matt Avila, Atmosphere Commercial Interiors; Chris Beal, JLL; James Cohn, CBRE; Shane Essert, HFF; Shelby Guddeck, DLR Group; Nicole Iglehart, Newmark Knight Frank; Chelsea Porter, The Renaissance Companies; Bryan Smith, GPEC; and Brian Zurek, Transwestern. The YPG program provides participants with access to industry leaders while taking a hands-on educational approach via case-based learning, said YPG Co-Chair Cullen Mahoney of Trammell Crow Company. “The program is well-suited for young real estate professionals looking to strategically grow their networks while learning the development business,” Mahoney said. Applications for the 2018-2019 NAIOP YPG Mentor Program will be available in September. All NAIOP members who are age 35 or under qualify to participate in the Developing Leaders program, whether they joined through the DL membership category or as part of a corporate membership.